These Syringe Filters have a 25mm diameter and come in two pore sizes, 0.22µm and 0.45µm. They are supplied in zip lock bags and very attractively priced. 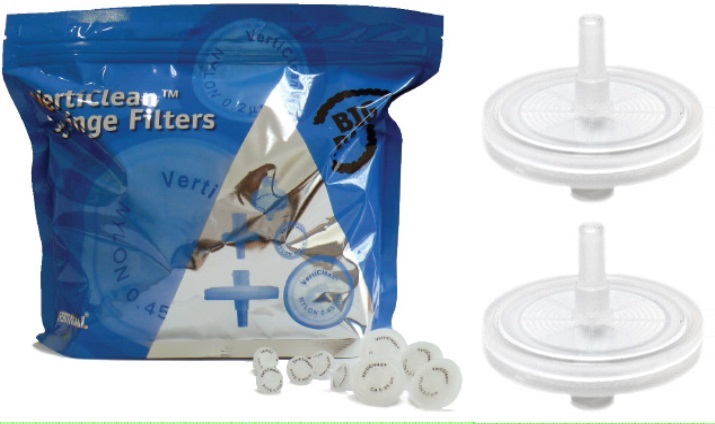 For aqueous and most solvent based compounds these filters will serve well, with medium protein binding. Use with care for biological compounds. PTFE (Teflon) membrane syringe filters have a hydrophobic nature and very high chemical resistance. As a result these syringe filters are not compatible with aqueous samples. They have a robust 25mm Ø housing of inert, low extractable, pigment free virgin polypropylene. A PTFE membrane is used to filter gases. Because of the chemical resistance it is the membrane of choice for applications that include esterification of air or gas samples, HPLC solvents, filtration of aggressive solvents, sampling of aerosols, venting air, or protecting vacuum pumps. These cellulose acetate syringe filters are intended for single use, ready to be used in clarification or sterilization in aqueous samples, biological fluids, protein samples, enzymes, cellular culture media, serum samples, alimentary samples, or wine sampling. Has limited solvent resistance and very low protein binding. Contact Rose Scientific for 13mm diameter syringe filters, or volume quantities.